In the weapons room, Thomas feels the answer to the problem of the maps inside of him. A sudden flash of knowledge tells Thomas what to do. Without telling them why, he says he needs wax paper from the kitchen, scissors, and black markers or pencils. Since Thomas had a role in the Maze’s creation, these epiphanies are not examples of his innate knowledge but instead of moments when he uncovers his memories. When Newt and Minho come back with the materials, Thomas orders everyone to trace the last ten days of each section of the Maze onto the wax paper. After tracing for a while, Newt says they should test out Thomas’ theory before they continue. Thomas lays a single tracing from each day and section on top of each other so that he has as an eight page stack. Now, when Thomas looks at the stack, the lines crisscross to reveal a dark image at the center of the page: the letter F.
With a more all-inclusive perspective, Thomas is able to decode the shifts in the Maze. No longer a random, meaningless structure, the Maze becomes a code that he can decipher. Since the Maze represents adolescence, Thomas’ new perspective shows that teenagers can better navigate the challenges of adolescence by looking at the “big picture” rather than getting stuck on any single aspect of their lives. Plaue, Ethan. "The Maze Runner Chapter 42." LitCharts. LitCharts LLC, 22 Jul 2015. Web. 23 Apr 2019. Plaue, Ethan. "The Maze Runner Chapter 42." LitCharts LLC, July 22, 2015. 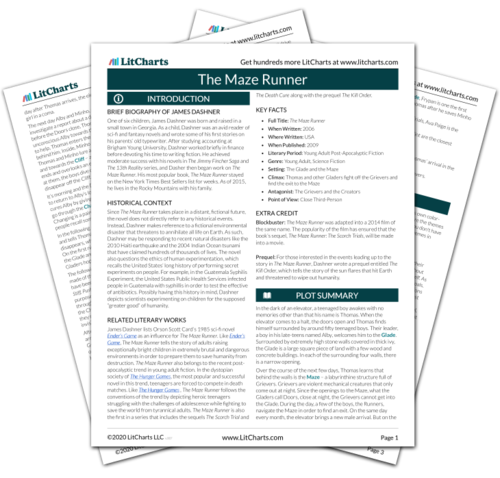 Retrieved April 23, 2019. https://www.litcharts.com/lit/the-maze-runner/chapter-42.